What do these have in common? Earth-energies expert Richard Leviton is convinced that these three seemingly distinct phenomena are all interconnected. And, he insists, the signs indicate something very real and very important is happening: we�re fast approaching the end of the world as we know it--and that might not be such a bad thing. In Signs on the Earth, Leviton combines newspaper and firsthand accounts with his own intuitive research to examine the exploding number of such reports from around the world. 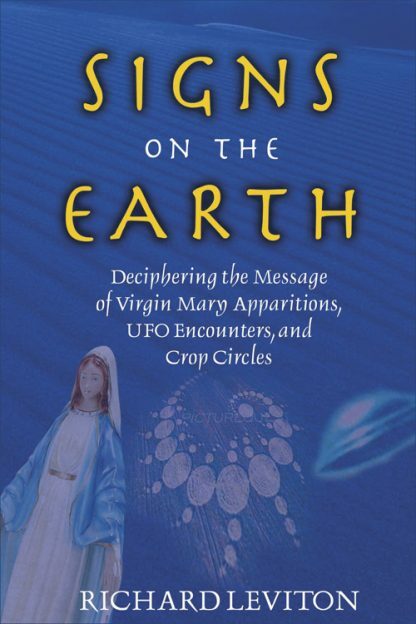 He focuses his study by selecting a handful of Marian apparition sites, including Lourdes, Fatima, Medjugorje, and others, as well as UFO hot spots such as California�s Topanga Canyon and the Hudson River Valley. For his investigation of the crop circle phenomenon, Leviton takes you Wiltshire, England, an area he calls the crop circle mecca. Encouraging you to think of the Earth as a cosmic bulletin board, Leviton believes that these phenomena are messages from the galaxy and the spiritual worlds offering us an unprecedented opportunity to enter the next level of reality. Signs on the Earth shows that these signs are literally directions to a 3-step process for looking within as well as beyond yourself, and unlocking your vast spiritual potential. Richard Leviton lives outside Santa Fe, New Mexico. He is the author of ten books including Brain Builders, The Galaxy on Earth, and The Healthy Living Space. A longtime journalist, he has published more than 400 articles and has served as chief editor of Alternative Medicine magazine and senior writer for Yoga Journal. Leviton is also the director of the Blue Room Consortium, a cosmic mysteries think tank in New Mexico.